I spent a lunch hour this week looking for a set of double bass strings. Once again I question my sanity for taking up this instrument. The strings are over 150 dollars ON SALE. Its a seductive instrument that pulls you at first sight. In the shop, it stands there as beautiful as a piece of well made furniture, though I doubt any piece of furniture in my house cost two grand. It’s voice is low and gorgeous when played by the right musician. Its a physical instrument and has substance in your arms as you hold it. But it is a demanding tyrant. 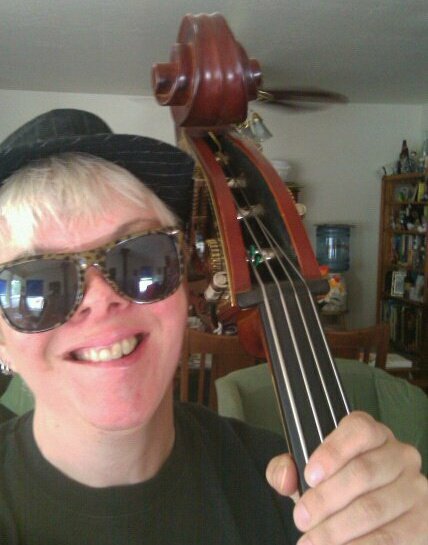 Nothing is cheap with a double bass. My husband used to jokingly call it the “two-hundred dollar money pit”, because any repair or upgrade seems to cost that amount. Strings? Replacement Bridges? Bows? Carrying Case? Replacement of end pin and cable? Two hundred dollars each. Pluck further down the neck, you’re choking your sound. More legato less staccato, let the notes ring. Keep your fingers in position; keep your fingers down on the strings. And I leave after 60 minutes feeling like I’ve made one inch further in a journey of a thousand miles. But as much as it demands from me as a musician, it gives back in the beauty of its voice and the challenge it presents each time I lean it against my torso. There are times when like Edgar Meyer says in the video below, that your fingers do what they are supposed to, it just feels right. And with that I leave you with Edgar Meyer and Bach. My brother’s long-suffering accordion teacher used to tell him he died a little every time he heard my brother play. At least you haven’t heard that yet. Keep up the hard work, it’ll pay off. Previous Adventures in the Punk DIY Kitchen: Things I won’t ever make again.